A quick perusal of the Scriptures will demonstrate clearly and powerfully that God wanted all the first things–the first born sheep; the first of the crops; the first of any money; the first day of the week; the first year of marriage; and the first born child or son. It is also clear that SATAN WANTS WHAT GOD WANTS. Those who understand the Bible and history understand that this especially applies to the first born child. 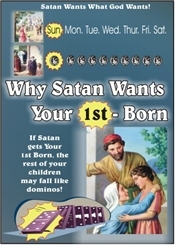 Do you know why Pastors and Christian leaders have three times as much difficulty training their firstborns? Do you know the consequences of not giving God the first things? Entire families should watch this video, but especially parents and their first born children. This sermon has changed the way we parent our children. It was the first sermon by Dr. Davis we heard, and we have since ordered copies for several friends.